Gateley is a parish in the Breckland district of Norfolk. It lies southeast of Great Ryburgh and northwest of North Elmham. The village is mentioned in the Domesday Book and the parish name is old English and translates as 'clearing where goats are kept'. This place name and documentary evidence suggests the settlement has been in existence since at least the Late Saxon period. To understand patterns of human activity in the landscape earlier than this we must turn to the archaeological records. The earliest dated find from the parish is a Neolithic flint axehead (NHER 6309). A Neolithic flint adze (NHER 29082) has also been discovered. Two copper alloy Bronze Age flanged axeheads (NHER 2893 and 2894) have also been discovered. Part of a possible Bronze Age ring ditch (NHER 31438) can be seen on aerial photographs. A prehistoric flint blade (NHER 29337) has also been found. There is also evidence for activity in the Roman period. Two Roman coins (NHER 29082 and 29413) have been discovered. Reports also suggest that Roman building material was used in an arch in St Helen's church (NHER 2933). Although the evidence for activity in the prehistoric and Roman periods is slight this may be more a result of a lack of archaeological research rather than a lack of activity during these periods. The same could be said of the Saxon period. Although the earliest parts of St Helen's church (NHER 2933) are Saxon most of it was built in the medieval period in Perpendicular style. No other Saxon finds have been made in the parish. There is more evidence for occupation in the medieval period. Earthworks of medieval or post medieval settlement (NHER 12160) can be seen on aerial photographs. A medieval or post medieval field system (NHER 28822) has also been identified. Metal detectorists have discovered several medieval coins (NHER 29413) including a Dutch silver plated double patard coin (NHER 29081). A medieval or post medieval jetton has also been recovered. 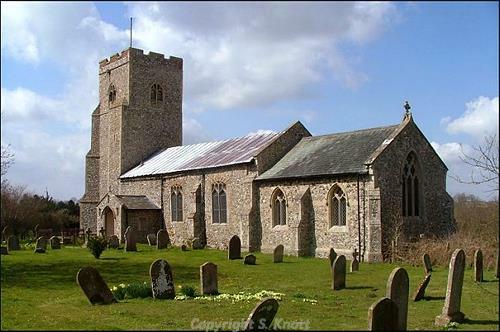 Several post medieval buildings from the parish have been recorded. Gateley Hall (NHER 12437) was built in 1726. Its 17th century timber framed barn with brick nogging (NHER 40688) and 18th century cart shed (NHER 40689) are also listed. Gateleyhill Farm (NHER 37145), further north of the main village, was also built in the 17th century. The most modern archaeological sites recorded in the database are the Wymondham to Wells light railway (NHER 13588) that was in operation between 1847 and 1962 and a World War Two bombing decoy (NHER 20535) that was built to protect nearby RAF West Raynham. Megan Dennis (NLA), 16 December 2005.